Tori Kara age is a Japanese appetizer recipe. 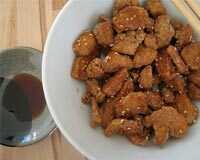 Learn how to make/prepare Tori Kara age by following this easy recipe. Mix grated ginger, garlic, soy sauce and salt. Marinate the chicken pieces for 30 minutes. Mix rice flour and plain flour. Roll each marinated piece in the flour mixture. Fry these chicken pieces till golden brown.